GM Nigel Short MBE, Commonwealth Chess Champion, President of the Commonwealth Chess Association, winner of the EU Championships 2006 (Liverpool) and English Champion has just joined our Forum. Nigel is a noted chess writer. He has written columns and book reviews for the British newspapers The Sunday Times, The Daily Telegraph, the Daily Mail and The Spectator. He wrote The Sunday Telegraph chess column for a decade. He most recently wrote for The Guardian. His final column appeared on October 19, 2006. He also reported on the FIDE World Chess Championship 2005 in San Luis, Argentina, for ChessBase. Widely considered to be one of the greatest post-war players not to have won the world championship (an accolade he shares with the likes of Paul Keres, Victor Korchnoi and Bent Larsen), he came agonizingly close to his goal when he drew the Moscow challenge match for the title of world champion by a score of 12-12 with Mikhail Botvinnik, the reigning champion. Bronstein led by one point with two games to go, but lost the 23rd game and drew the 24th and final game. Under FIDE rules, the title remained with the holder, and Bronstein was never to come so close again. More tributes on Chessbase, TWIC and our forum. And also more links from John Saunder's BCM site: The Guardian (Leonard Barden), ECF (Stewart Reuben), Daily Telegraph, The Times, The Independent (Bill Hartston) and Google News. Your browser does not support inline frames or is currently configured not to display inline frames. Vladimir Kramnik lost his 6 game match against Deep Fritz 10. He never seemed to recover from his 2nd round careless mate in one, defeat. To be fair he did demonstrate ways to combat the computer with splendid endgame play but it appears he was simply out-gunned overall. He won't feel too bad however now that he's tucked away another £250,000 or thereabouts. Not bad for 10 or 11 days 'work'. Kramnik played a very spirited final game and it was a very double-edged encounter, with the computer playing some unusual and deep ideas to gain the upper hand and win the game on move 47. The event was staged from November 25th until December 5th in the National Art Gallery in Bonn. It was sponsored by RAG AG, one of Europe's largest energy companies. If Kramnik had won the match he would have taken home a hefty prize of one million US dollars (£505,204) but got half of that even though he lost. Full reports of each round with excellent photos and analysis and downloads on Chessbase. More reports and details also available on the Official website. That this House welcomes the recent outstanding success of the International Chess Tournament held in Liverpool between 6th and 15th September noting that this was the first international chess tournament held in the UK since 1986 and the first in Liverpool since 1923; recognises the sponsors including Liverpool John Moores University, the Mersey Partnership, the World Museum and the Liverpool Culture Company for their support for the event; believes that this was a major boost to Liverpool's reputation not least because it received massive internet exposure by the live transmission of the matches on the tournament website which was visited by 8.6 million people from 104 different countries, 1.25 million people logged on to the live transmission on the final day, 76 per cent. of whom stayed online for an hour or more; and congratulates British Grandmaster Nigel Short on winning the tournament in a strong field of international players as well as recognising the Grandmaster norms achieved by two young British players. Most of the signatures so far are Labour MPs, no doubt reflecting Angela Eagle's lobby on our behalf. But it needn't stay that way, and probably won't. If you would like your own MP to sign, send him/her an email drawing the EDM to their attention. It all helps. Council welcomes the success of the recent International Chess Tournament in Liverpool and congratulates the organisers and participants for their efforts.  • Promote Liverpool as a city with a particular interest in chess, advocating the wider cultural, educational and economic benefits this can bring. All of this interest and support needs to be followed up skilfully and with political adroitness. I'm doing my best of course. But we have much more to do. So far, so good though. As of this morning (Oct 19), 58 MPs have now signed the Early Day Motion, including members of all main political parties and some minor parties too. And last night, Liverpool City Council unanimously approved the motion on chess development in the city. In a dramatic fourth game of the rapidplay tiebreak match Vladimir Kramnik defeated Veselin Topalov to win the World Chess Championship. The first game had ended drawn after 47 moves. They then both won a game, Kramnik game 2 in 45 moves and then Topalov game 3 in 50 moves. In the final game Kramnik gradually outplayed Topalov and with two passed pawns the win looked almost inevitable. Topalov although slightly better on the clock miscalculated and overlooked the loss of a rook. He was forced to resign. Kramnik therefore becomes the 14th undisputed World Chess Champion, the first time this has occurred in 13 years. All the analysis, reports and photos can be seen on Chessbase, TWIC and ICC. In the face of great psychological pressure many believe justice has at last been done. Kramnik has come through the greatest test of his career and prevailed but what now for Topalov? The Unification world title match between Veselin Topalov and Vladimir Kramnik started on Saturday September 23rd 2006 in Elista. Interestingly Kasparov has predicted a narrow win for Topalov but he got off to the worst possible start losing with the black pieces in 75 moves. Your browser does not support inline frames or is currently configured not to display inline frames. The $1million prize fund will be split evenly between the players regardless of the outcome. Both players can use their attacking flair to the full, possibly Topalov having the edge but despite the jibes at Kramnik's rather dull style he is a dangerous rival for Topalov. Their current FIDE ratings are Kramnik 2743 and Topalov 2813 (source: FIDE July 2006 ratings). Wikipedia has Kramnik and Topalov biographies with information about the town of Elista and the Kalmykia region. Overall match score: 8½ - 7½ to Kramnik. 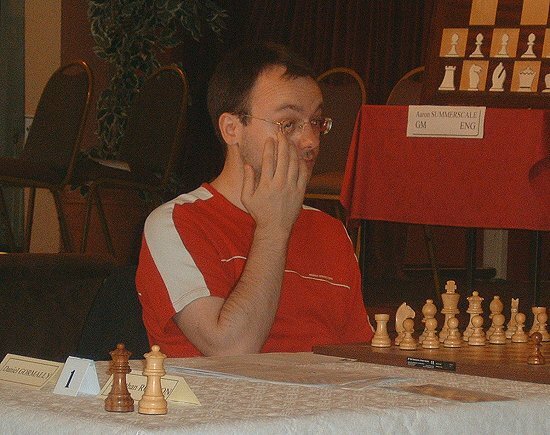 The Monarch Assurance Isle of Man International 2006 was won by GM Alexander Areshchenko (Ukraine), winning on tie-break from GM Sergey Volkov. Both players scored 7/9. The women's prize was won by Elisabeth Paehtz of Germany. Gary Quillan (ENG) and Anna Zatonskih (USA) made IM norms. This ran from Saturday 16th September - Sunday 17th September. Results round up available on the congress website. This event followed immediately after the EU event in the World Museum. Results and crosstable are still awaited for the Minor section. There can be little doubt that the recently held European Individual Championships at the World Museum Liverpool was a great success. This was no fluke and was in very large part due to the courage, determination, diplomatic skills and hard work of Professor David Robertson, Head of the Public Policy Institute at John Moores University and chairman of the Liverpool Chess Foundation. Messages of congratulation have been flowing in many days after the chess finished. David was the driving force behind the event co-ordinating numerous disparate groups all with one common goal; to put international chess in Liverpool 'back on the map'. It was the strongest event in Britain for 20 years. The tournament generated worldwide interest with over 18 million hits on the official site during the ten day event and over 750,000 viewers watched the live games each day. Press coverage has been extensive and links to the various articles by Malcolm Pein Telegraph, Jon Speelman Observer, Raymond Keene The Times and others can be seen on our forum. The first phase of David's long term aim "to position Liverpool as a 21st century city, via the catalyst of chess, showcased globally through the media and the internet", has been realised in style. 18 Grandmasters and 10 International Masters competed in a field of 84 over 10 rounds. There were players from a number of European nations the majority being British and in addition to Nigel Short, Luke McShane and Stuart Conquest, together with Zoltan Gyimesi (Hungary) and Thomas Luther (Germany). International Masters Gawain Jones (England) and Stephen Gordon (England) both achieved their first GM norms scoring 7/10. The ECF declared the event 'a triumph for English chess'. The Championships were sponsored by the Mersey Partnership, Liverpool John Moores University, the Liverpool Capital of Culture Company and the World Museum to whom our grateful thanks must go. We were also supported by the Friends of Chess and Kenyon Fraser marketing communications were responsible for the PR. Daily reports, game downloads, crosstables, results and press details are available on the official website. There are plans already taking shape to scale up next year by organising a yet more prestigious event. David has ambitions to turn his attention to other world-class opportunities. More information and details will be posted on this website and the forum in due course. See a photo report on this website here. Game downloads available for all events in PGN format. 18th July 2006 - "As I mentioned in my follow-up to Sean's comment on my original article, a really good place to go to find out what is happening as regards the dispute between the NCCU and the ECF about the Northern Members' Scheme is the Atticus Chess website. I've put a link in too at BCM's links page but you can click here - http://www.atticuschess.org.uk/ . There is a lot more excellent information to be found there too. While chess seems to be struggling in many parts of Britain, Merseyside is a shining exception. As well as the European Union Championships, which is being played in Liverpool from 6-15 September, it looks like they will be hosting an international tournament in 2007 and also the British Championships in 2008.
http://www.atticuschess.org.uk/forum/phpBB2/index.php . Actually, they are very friendly to visitors there, though chess officialdom often comes in for a verbal battering (quite deservedly so, in many cases). There are a lot of trenchant comments on the NCCU vs ECF battle but the great majority are well-argued and even-handed. It took me hours ploughing through all the stuff on Atticus CC, but I think I am better informed as a result. Also, I feel generally uplifted by the open and honest debate, and the sense that there are still people out there working intelligently to improve the running of British chess. 17th July 2006 - The list of entrants to this event is growing more impressive each day. GM Jonathan Rowson is now a certainty together with GM Luke McShane. Other possibilities are being negotiated. For more details including tournament conditions and entry forms, click here. Please note that immediately following this prestigious tournament is the Liverpool Congress 16th-17th September also at the World Museum. More information about this event will be posted here soon. 16th July 2006 - Aleksander Wojtkiewicz (January 15, 1963, Riga - July 14, 2006). He was Polish by nationality but was born in Latvia, USSR. He was jailed by the Soviets for two years because he refused to serve in the Soviet Army. When Poland regained independence he moved from Riga to Warsaw where he won two Polish Chess Championships. He later resided in the United States. He was one of the most active players in the world, constantly flying around playing in chess tournaments. Several times he won the annual $10,000 first prize for Grand Prix chess tournaments in the United States. 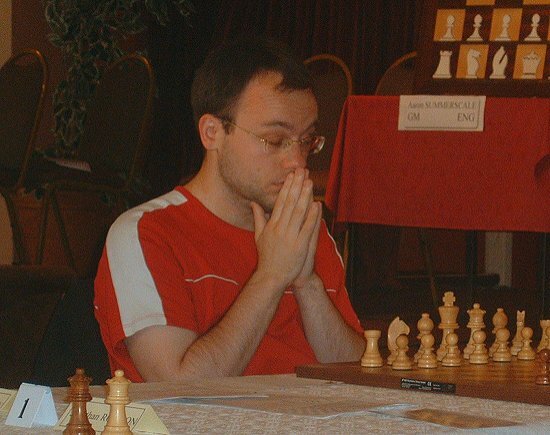 Wojtkiewicz played in the FIDE World Chess Championship 2004. In his final months, he tied for first at the 2006 World Open in Philadelphia and won the 2006 National Open in Las Vegas. He died of liver problems. 3rd July 2006 - With Kasparov "inactive" and no longer appearing on the FIDE rating list, Veselin Topalov takes top place with an ELO of 2813. Anand has dropped badly after a poor play at the Olympiad, but remains in second. Vladimir Kramnik, recovering from an illness, has climbed to fourth behind Levon Aronian. Full lists. 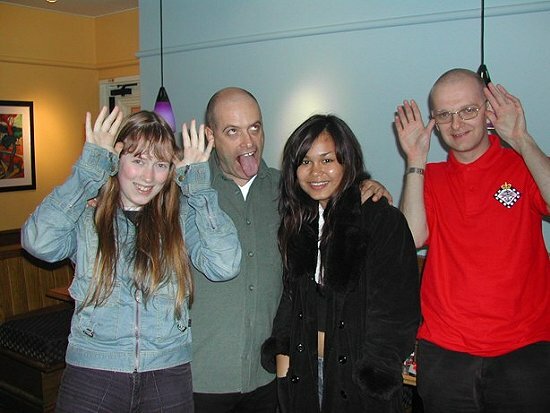 6th June 2006 - What’s to be made of the news that our GM, Danny Gormally, was sent home from the Turin Olympiad ‘for his own safety’ after decking Armenian super-GM Lev Aronian for dancing with his love-interest, and then himself being duffed up by a posse of young Armenians? The Times published their version of the incident the day after. Many others followed including all the tabloids. For more online reports, click here. Battle of the chess grandmasters as leading England player 'attacks' rival over dance floor move. FOR one British grandmaster, his rival had made a move too far. Danny Gormally, one of Britain’s leading chess players, allegedly attacked the world No 3 at an international tournament for dancing with a beautiful Australian player. Levon Aronian, leading light of the Armenian chess scene, was apparently punched and shoved, and ended up on the floor during a party at the recent Chess Olympiad in Turin. 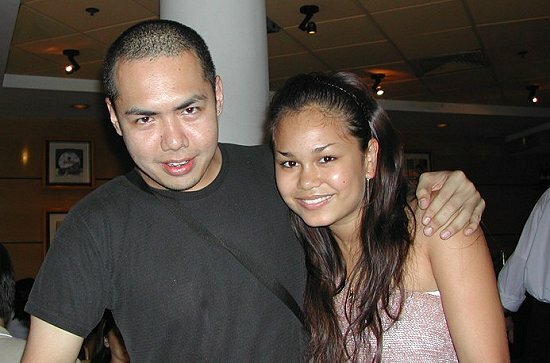 He had been spotted jiving with Arianne Caoili, 19, an Australian grandmaster known as the Anna Kournikova of the chess world. Mr Gormally was known by team-mates to be fond of her. But the next day, after the England captain apologised to the Armenian team, the repercussions continued. When Mr Gormally went out for a coffee with friends, he was attacked by a group of young Armenian players seemingly bent on revenge for their star player. The unseemly events are expected to lead to an urgent inquiry by the English Chess Federation into Mr Gormally’s behaviour. He was advised to leave the tournament early to avoid further confrontation. Allan Beardsworth, the England captain, said that drink appeared to play a part. “Danny seems to have punched Aronian for innocently dancing with a girl that he liked. The following day, there was a retaliatory incident. It is a shame, and something that we will have to look into properly,” he said. The Olympiad is held every two years between 150 international teams and brings together the world’s best players. While the tournament went badly for Mr Gormally and the England team, the Armenians eventually won. The party was held four days ago at a nightclub called “Hiroshima Mon Amour”. Mr Gormally, 30, from Durham, spotted Ms Caoili, with whom he had struck up an e-mail relationship, according to colleagues. They are also known to have met in London. Ms Caoili, a child prodigy of Filipino descent who has ambitions of becoming a professional singer, was dancing “energetically” with Mr Aronian. She is ranked No 3 in Australia. Mr Aronian, 23, often referred to as a future world champion, is adored in his country where chess is the national sport. For Mr Gormally, the sight of the pair dancing was apparently too much — but his actions were unjustified, according to Mr Beardsworth. “I have spoken to several people who were there, and there is no doubt that Danny was in the wrong. Aronian is a lovely guy and at the very peak of his national sport. I have been told that he is treated like David Beckham at home,” he said. The England team’s management was informed of the incident and held an impromptu meeting. By 11am the next day, it had apologised to the Armenian team leader, who also happens to be the country’s defence minister. There is no suggestion of any criminal inquiry. Mr Gormally was informed, and hoped that the incident was over. However, when he went out with friends for a coffee, he was spotted by young chess players from Armenia. “They set upon Danny — he was hit several times. Luckily, one of the team-mates with Danny could speak Russian and managed to calm them down,” Mr Beardsworth said. Denis Jessop, president of the Australian Chess Federation, said that he may launch his own inquiry. “I have heard that an incident took place and that Aronian was thumped and that it was over Arianne. “I am not surprised at anything that chess players do. It is not the first time that there’s been an argument at a chess tournament and people have hit each other,” he said. After you’ve scanned the world’s front pages and stopped laughing, you’ll be glad to know Danny’s back home where he belongs - with his Mum. Meanwhile the love-interest, 19 year-old Filipino-Australian Arianne Caoili is refusing all calls and has gone off to play chess in a remote Italian town. So who is Arianne Caoili, the woman in the middle of this slugfest? First off, Arianne Caoili is a genuine chessplayer, has been since she was a kid, and is now a WIM. 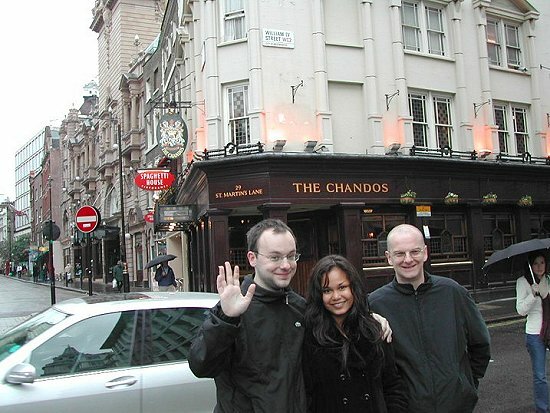 Here she is ten years ago with the late (and great) Tony Miles, Britain’s first official GM. She looks different here too. Arianne is the one not auditioning for permanent residence in a mental hospital. The others are, from left to right, Heather Richards, England women’s international and occasional player for Liverpool this season; GM Keith Arkell, conforming to standards frequently observed in male GMs; and the other bloke is IM Lawrence Cooper. Danny Gormally and Arianne in happier times. Danny (on the left) looks suitably self-satisfied as he ‘hi fans’ the camera. Little does he know, but there’s a gang of jealous Armenians getting tanked up in the pub across the road, just waiting for the rain to stop before lamping him. I don’t think Mr Cooper (right) looks like he’ll turn the tide if that happens. But let’s hope Danny never sees this photo. If the Armenians don’t get him, this bloke looks like he could. Then again, if Danny’s up for smacking an Armenian national hero, he might be ready to take on the entire Filipino army. Who knows with fighting spirit like his! For more gossip, visit our Forum Gormally thread here. Contributions positively encouraged! 6th June 2006 - Can you think of a caption for either of these? Just a bit of fun (keep it clean). Entries to the webmaster or posted on our forum in the Gormally thread. 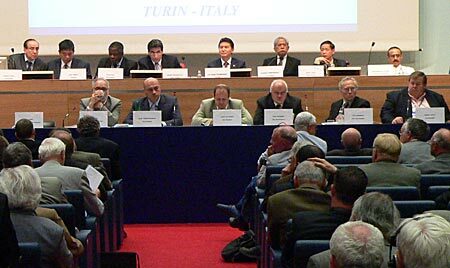 The FIDE General Assembly and election, Turin 2006. 6th June 2006 - Gerry Walsh (far right) sitting two along from Bessel Kok (centre). In his speech, Kok spoke for fifteen minutes, laying out detailed plans to reform FIDE. And boy, does it need reforming! The incumbent, Kirsan Ilyumzhinov is president of the poverty-stricken Russian republic of Kalmykia where political opposition is banned. He doesn’t allow much within FIDE either, but does claim to be in regular touch with space aliens. Ilyumzhinov spoke for twenty seconds to say how much he loved chess. His supporters applauded wildly; even the aliens were impressed. Perhaps they voted too; Ilyumzhinov won 96-54. So no change there then. You get some idea of what FIDE is like from this pic. This politburo-style line-up is actually called the FIDE Central Committee. Given that one third of the players in Turin were women, you might have expected at least a small nod in the direction of gender equality. Think on; you’ll get none from this dismally blokish platform. It remains to be seen, now that the votes are in the bag, whether Ilyumzhinov will honour an undertaking made during the election campaign to fund a Kramnik-Topalov world title unification match. We shall see; and so will the space aliens. Comments: Dave Robertson, Atticus CC. 6th June 2006 - All the information you could possibly need and nicely laid out too with team overviews, team and board pairings, best players, games and printable lists in excel format is available from the chess archive of Wiener-Zeitung. An excellent site. 21st May 2006 - Topalov performed miraculously to comeback in this event last year and this year he again came from a negative score to win his last four games and finish in clear first. In the final round Topalov defeated Bacrot to edge ahead of Kamsky, who drew with Svidler. Kamsky took clear second for an impressive result. Anand should have equalled him but he was in time trouble again against Ponomariov. This caused him to miss a clear win with 37..g2! and the draw left him in third place. Svidler finished on an even score. In his final two games he declined to push on with slight advantages. The Russian got compensation by playing a great game to beat Topalov in the sixth round. Ponomariov and Bacrot floated at the bottom of the table during the entire event. Ponomariov missed a chance to play spoiler when he turned a win into a loss against Topalov in round eight. Topalov and Ponomariov are the only players in the field who aren't joining their national teams at the Turin Olympiad. 1st May 2006 - The final round climax saw Wood Green 1 and Guildford ADC 1 bring out the big guns. GM Judith Polgar Elo 2711 making her 4NCL debut on Bd2 for Wood Green 1 alongside regular GM Mickey Adams Elo 2720 on Bd1. Photos here. Full match details available on the 4NCL site with games. The BCM site also features a nice report here. 1st May 2006 - FM Dave James (Atticus CC) will be attending the 77th FIDE Congress as Welsh FIDE delegate. The Congress is being held concurrently with the World Chess Olympiad in Turin, Italy which starts on 20th May and ends 4th June. Official site. Details of the British players selected for Turin are available. England, Wales and Scotland have announced their squads. Ireland are going but no details are yet available on their website http://www.irishchessunion.com/ (26th April). 14th April 2006 - Following the FIDE presidential board meeting in the United Arab Emirates an announcement was made of the unification world championship match between FIDE champion Veselin Topalov and Vladimir Kramnik, who beat Garry Kasparov for the classical title in 2000. Your browser does not support inline frames or is currently configured not to display inline frames. The twelve game match will run from Sept 21st - Oct 13th in Elista, the capital of Kalmykia. The $1million prize fund will be split evenly between the players regardless of the outcome. There are however a number of concerns over the match and FIDE Presidential candidate Bessel Kok, who initiated the reunification process back in 2002, has his say here. Meanwhile, Wikipedia have biographies of both players, click here for Kramnik's and here for Topalov's. For more information about the town of Elista, the proposed venue click here and of the Kalmykia region here . Also alongside, a sample of 15 games between the two contenders. Women's World Championship, Ekaterinburg, Russia. 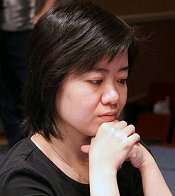 The Chinese WGM Xu Yuhua has won the 2006 FIDE Womens World Championship in Ekaterinburg, Russia. She won the third game decisively and the match 2½-½ against the Russian IM Alisa Galliamova. The fourth game was not needed. The Championships took place from 11th-27th March. 64 players took part in a brutal knock-out tournament, with two-game matches in each round until the final, which was intended to be four games. Many of the world's leading players took part including Antoaneta Stefanova of Bulgaria, Humpy Koneru (IND), Kateryna Lahno (UKR), Alexandra Kosteniuk (RUS), former champion Maia Chiburdanidze (GEO), Pia Cramling (SWE), Xu Yuhua (CHN), England's Jovanka Houska and former European women's champion Almira Skripchenko. All the games and more details available at the official website: http://womenchess.com. The final (live games) were broadcast live on the ICC. All 181 games in PGN or viewer. Xu Yuhua, the representative of China is the only two time winner of the Women World Chess Cup. When asked about her impressions of Yekaterinburg and about the Championship’s organization, she rather predictably replied, "I really like your city. We were very well received at the airport; as for the hotel, food, playing hall, organization – everything is the best. Unfortunately I didn’t have enough time to walk about the city, but I’ve already visited the church nearby". Ekaterinburg is one of the biggest cities in Russia. The population is 1,337,000, 30% of those within the Sverdlovsk Region. It is the fourth most populated city in Russia and was founded as the fortress-plant upon the Ural River. The name of “Ekaterinburg” emphasized the characteristics of the new city. It is the city of Empress Ekaterina I and St. Ekaterina the patron of mining. Nowadays Ekaterinburg is an influential centre of financial and banking activity, a city of developing trade infrastructure, tourist, cultural and entertainment services. About 30% of the population are employed in small and middle scale business. 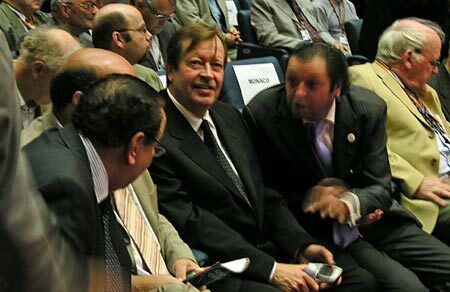 14th March 2006 - For the first time in it's history the Linares tournament took place in Mexico and Spain. The first half was held in Morelia, Mexico (Feb 18th-26th) and the second half in its traditional venue of Linares, Spain (March 3rd-11th). It was an 8 player double round, all-play-all. The players were, Topalov (BUL, 2801), Svidler (RUS, 2765), Aronian (ARM, 2752), Leko (HUN, 2740), Ivanchuk (UKR, 2729), Bacrot (FRA, 2717), Radjabov (AZE, 2700), Vallejo Pons (ESP, 2650). Round 14 Sat 11th March: 24 year old Armenian GM Levon Aronian, the current World Cup champion won the event after his powerful performance with black against Peter Leko in the final round. The game, virtually won after 20 moves was Leko's second consecutive defeat. Favourite and World Champion Topalov could only draw with Vallejo Pons leaving him with 8/14, not bad considering his terrible start. Radjabov drew with Bacrot and Svidler also drew with Ivanchuk in a close R+N v R+B ending. Games in Java Viewer. Official website. Illustrated reports of earlier rounds here.